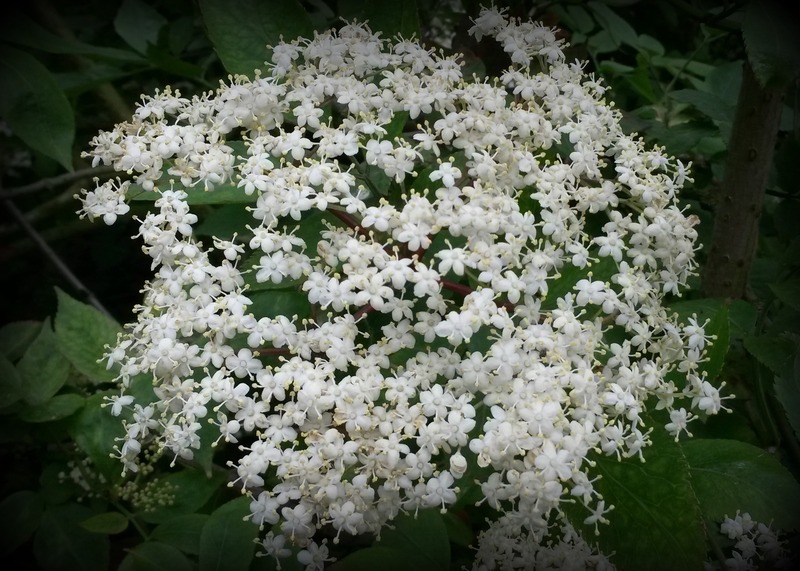 I mentioned a couple of weeks ago that I’d been eyeing up the gorgeous elderflowers in the hedgerows on my walk to work and had plans to use some of it. This weekend, I finally got around to it, and a good thing too, as I don’t think the blossoms are going to be around for that much longer in this part of the country. On Friday evening, I stopped at the chemist to buy some citric acid for my recipe but was told they’d just sold out. So I got up early on Saturday morning to try my luck at the chemist around the corner from our house. 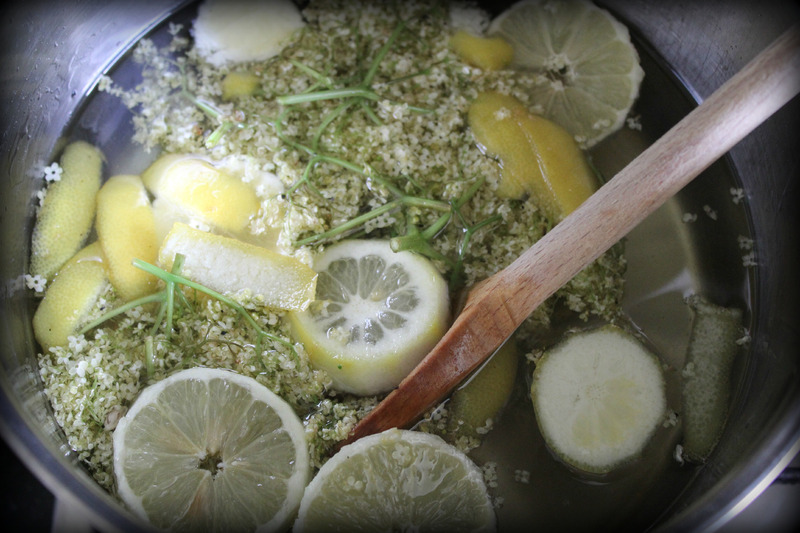 “You’re making elderflower cordial?” The chemist said with a wry smile as soon as I asked if he sold citric acid. He told me it had been flying off the shelves recently. (So it seems I’m not the only forager in the neighbourhood – useful to know!) I bought the last two boxes and Ade and I headed to the canal, armed with a pair of secateurs. 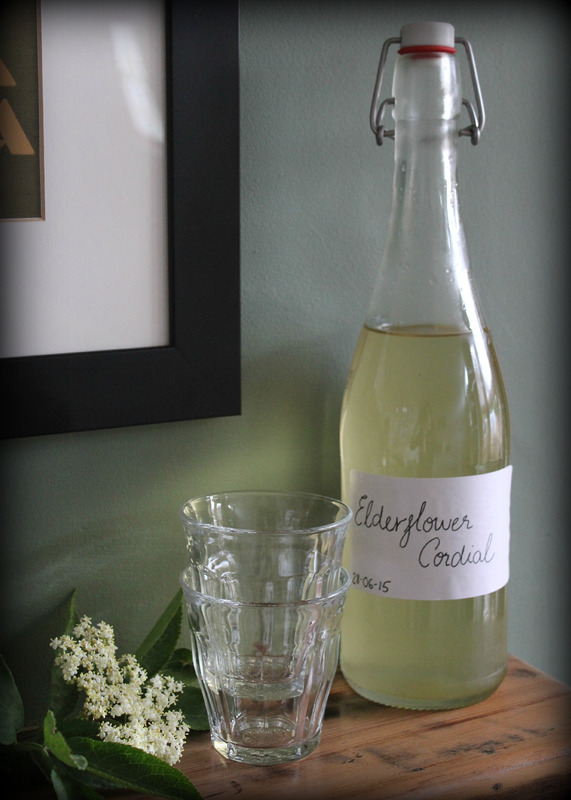 As soon as I got home with my bag of fragrant blossom, I started making elderflower cordial using this recipe. I let it steep for over 24 hours then strained and bottled it this afternoon. We just tried some poured over ice with still water and it’s delicious! A true taste of English summer. We have family coming up to stay with us this week and I’m looking forward to serving it with sparkling wine as an aperitif, elderflower fizz! I also had a visit from our lovely neighbour, Donna, while I was infusing my elderflowers yesterday. She gave me a bag full of ripe and juicy cherries which she’d just picked from her allotment – a welcome present indeed seeing as the young cherry tree in our back garden will probably give us half a dozen cherries if we’re lucky. While I ponder what to do with the cherries, we’re still harvesting plenty of green veggies from the allotment which I’m throwing into pasta and stir-fries. They also taste great in my Risotto Primavera. Busy times in the kitchen just now! I’m going to have to look into this stuff. There might be a place I could harvest some flowers soon. It’s the first time I’ve made it, and it’s really lovely, I highly recommend it! I made a small batch! Any idea what prpopotions to use when mixing it with sparkling water or wine? It’s so good! I put an ounce of cordial, an ounce of vodka and five ounces of club soda over ice. I thought the lemon would overpower the flowers but they do come through.